This article was submitted by Dan Bottom, a current Howard L. McKee Ecology Resident at Sitka. Dan is a fishery research biologist who worked in state and federal government for 38 years, including 22 years with the Oregon Department of Fish and Wildlife in Corvallis and 16 years with the National Oceanic and Atmospheric Administration in Newport, Oregon. His research interests include salmon, estuaries, and environmental history. He helped to initiate a long-term study of the effects of wetland restoration on salmon populations in the Salmon River estuary, right in Sitka's backyard. Dan retired from federal service in 2016 but continues serving as Courtesy Faculty at Oregon State University and as a technical advisor for a large habitat restoration program in the Columbia River estuary. Click here for Part One and Part Two. It is easy to see why people were so excited about salmon hatcheries in the late 1800s. Atlantic salmon and other prized fish species had long been depleted on the East Coast, and the industrialized fishery was beginning to take a toll on once seemingly inexhaustible runs of Columbia River salmon. The new technology offered an elegant solution for the declining fish supply: make fish so abundant that unpopular restrictions on harvest and habitat would be unnecessary. It was simple math. If 90% of the salmon eggs could be hatched artificially-a number many times greater than their natural rate of survival-think of all the additional adult salmon that would return! And with several thousand eggs produced by every additional adult female, hatcheries could release millions more salmon the following year. And then, when all the survivors of all those fish returned to spawn. . .
Of course, the math was never that simple; hatcheries could never satisfy such lofty expectations. Each additional juvenile that survived in a controlled hatchery setting did not ultimately produce another adult salmon. Still, the notion that technology could readily increase the fish supply captured the public's imagination and dominated both the science and management of Oregon salmon for more than a century. I can think of no better example of the supply-side philosophy of fisheries management than the Coho Salmon hatchery program at the Salmon River. Salmon River Hatchery was the last State fish production facility built on the Oregon coast. Chinook Salmon were first released in the Salmon River in 1977 (yearling Coho Salmon were released in 1978), exactly 100 years after the first hatchery in Oregon began operating in the Columbia's Clackamas River. Ironically, Salmon River Hatchery opened for business just as Oregon's Coho salmon troll fishery was collapsing. During the 1960s and early 1970s, the Oregon Coho Salmon fishery had expanded well beyond sustainable levels, subsidized by an ever-increasing supply of hatchery fish that masked the underlying depletion of a diversity of wild salmon populations. Yet the combined damage from overharvest and decades of habitat loss only became obvious after 1976, when ocean conditions suddenly shifted and became much less favorable for salmon. The survival rates of all those hatchery fish immediately plummeted, and the offshore fishery collapsed. In hindsight, given all the changes that had coalesced by the late 1970s, it is hardly surprising that the Salmon River Coho population was quickly supplanted by fish from the new hatchery. When the Oregon Department of Fish and Wildlife (ODFW) completed its 2005 assessment of coastal Coho Salmon, only the Salmon River population failed all the indicators of viability. The most notable measure was the lack of wild Coho Salmon. By the 1990s, 80% to 100% of the Coho Salmon returning to spawn in the Salmon River were hatchery fish, identifiable by the distinct marks (i.e., fin clips) given to all individuals before their release. The small proportion of unmarked fish on the spawning grounds clearly showed that very few naturally spawned salmon were surviving. 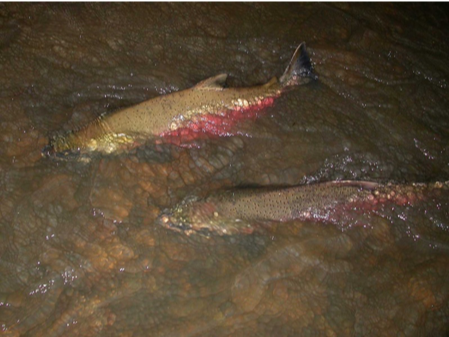 ODFW biologists concluded that the principal threat to the wild population in the Salmon River was the hatchery itself. The Coho Salmon program at Salmon River Hatchery was discontinued in 2008. The hatchery still releases ~200,000 juvenile Chinook salmon annually into the Salmon River. Once established, hatchery programs rarely end. Conventional thinking and established practices are difficult to change. Yet concerns about discontinuing the Coho Salmon program at Salmon River Hatchery are understandable. Since nearly all the adults spawning in the basin came from the hatchery, it was uncertain whether adults would soon return if all the hatchery releases suddenly ended. The decision to halt a 30-year-old hatchery program constituted a rare management "experiment" to test whether the harmful effects on a wild Coho Salmon population were indeed reversible. I doubt ODFW researchers anticipated such an immediate response to the hatchery closure. Despite fears to the contrary, adult returns did not collapse. Within a few years, the hatchery-dominated population was replaced by an equal or greater number of naturally spawned salmon. Accounting for the total number of fish harvested each year, the average adult abundance in the Salmon River actually increased after the hatchery program ended. This trend was not simply the result of some fortuitous shift in a fickle ocean environment. The adult abundance increased even though ocean indicators for salmon survival were poor or neutral during the post-hatchery period (2009-2016). Freed from hatchery influence, the Coho Salmon population rapidly extended its spawning period. The Salmon River Coho, like most coastal populations, historically spawned from November into February. However, inadvertent selection in the hatchery had advanced and narrowed the spawning period to just a one-month interval between late October and late November. This narrow range may have contributed to the poor survival of the Salmon River Coho. A brief fall spawning period left the entire population vulnerable to any subsequent winter storms and floods that scoured salmon eggs from their gravel nests. With each successive generation since the hatchery program ended, the spawning period has expanded. Half of the Salmon River population now spawns after November, and spawning continues into early January. Although still shorter than the historical period, the trend is clearly positive. Perhaps the most surprising result of the hatchery change was the salmon population's response to estuary restoration. In 1978, the same year the first batch of Coho Salmon were released from the new hatchery, the U.S. Forest Service restored its first tidal marsh in the Salmon River estuary. 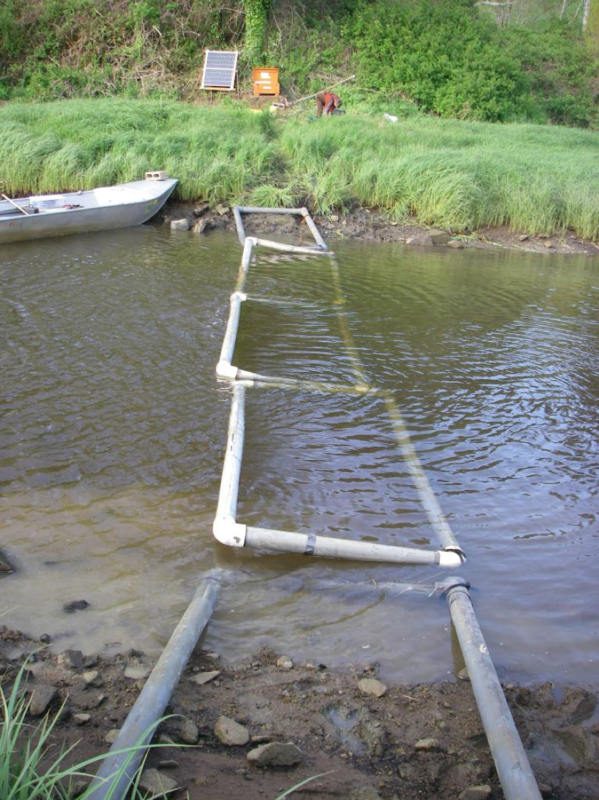 By 1998, the agency had reconnected about 60% of the estuary's formerly diked wetlands, and ODFW biologists discovered both juvenile Chinook and Coho Salmon rearing in the newly accessible marsh channels. 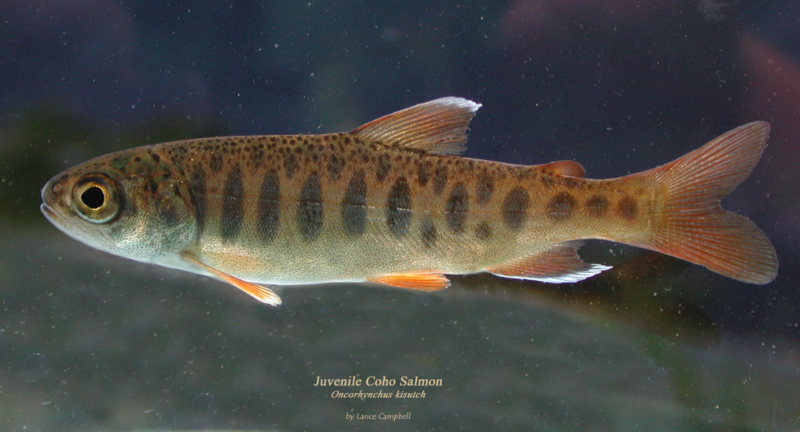 Back then the Coho Salmon population realized few benefits from the estuary restoration; few naturally-spawned adults were surviving to return to the Salmon River, regardless whether the juveniles had reared in freshwater or in the restored estuary. Only a decade later-after the hatchery program had ended and wild salmon survival had improved-did estuary restoration contribute significantly to the Coho Salmon population. One quarter to one third of the adult Coho Salmon that now spawn in the Salmon River are the survivors of estuary-reared juveniles-the late beneficiaries of a decades-old estuary restoration effort. 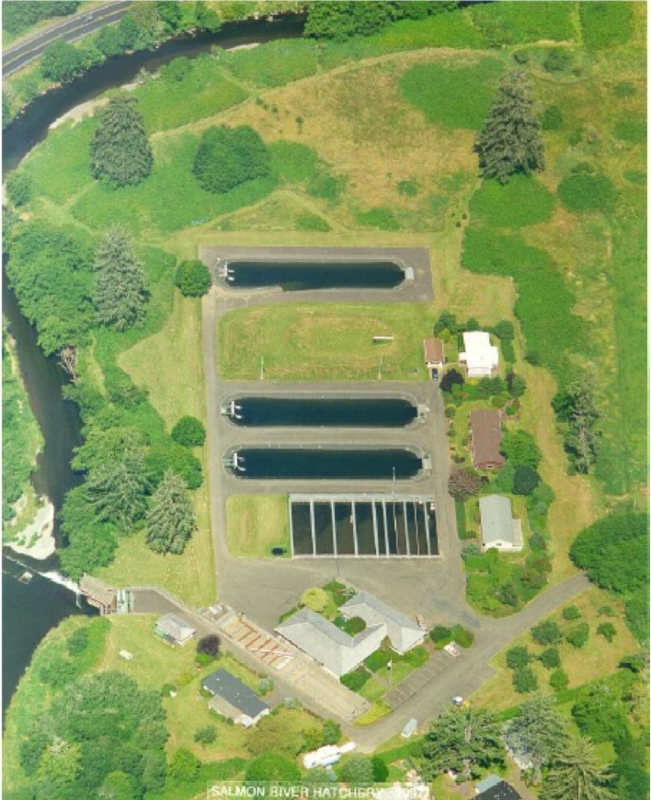 The Salmon River Hatchery, like most other salmon production programs, clearly did not multiply the number of adult Coho Salmon. Ignoring the costs, it was largely a zero-sum game. The hatchery program replaced the naturally spawned population from the river with an equal or smaller number of adults that had been hatched in plastic trays and reared in concrete raceways. When the hatchery program ended in 2008, the replacement process soon reversed. The recovering Coho Salmon population now returns about the same number of adults from less than 22,000 naturally produced "smolts" (i.e., outmigrating juveniles) as returned from ~200,000 hatchery-produced fish. Simple math indeed. Despite all the miscalculations and readjustments, the story of the Salmon River is a hopeful one. Salmon are incredibly resilient if given half a chance. At the Salmon River people often have rejected changes that diminished the river's natural productivity, choosing instead to give the watershed and its salmon a chance: the Cascade Head Experimental Forest (established 1934), the protected (Van Duzer) river corridor (1935-42), the Cascade Head Scenic Research Area (1974), the Cascade Head Marine Reserve and Marine Protected Area (2013), the restored tidal marshes (1978 - 2014), the decision to end a Coho Salmon hatchery program (2008). If the Hatchery Story was all about circumventing Nature's limits, the Salmon River Story is about finally coming to terms with them. Gradually, parts of this river, estuary, and nearshore ocean have been restored or protected, stitched back together and secured in the life cycles of wild salmon, steelhead, and cutthroat trout. Many challenges still remain even here. But by returning to salmon their river, we have become more at home in this place. This series of newsletter articles describes the work of many talented researchers who have studied the Chinook and Coho Salmon populations in the Salmon River, including from ODFW, Bob Mullen (retired), Kim Jones (retired), Trevan Cornwell, Stacii Stein, and Dave Hering (Oregon Department of Fish and Wildlife); and from the University of Washington, Si Simenstad, Ayesha Gray, and Alisa Bieber. For additional information or technical publications contact Dan Bottom.